What I've never quite understood amidst all the huffing and puffing about our health service is: who needs it? Survey after survey shows the Irish to be a remarkably happy and healthy bunch. The latest such study is from the Central Statistics Office and entitled Health Status and Health Service Utilisation (pdf). 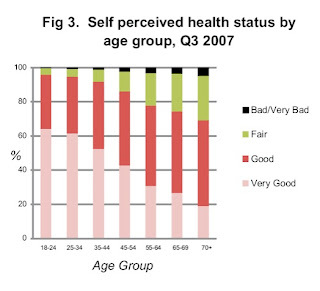 The chart - from the study - shows self-perceptions of health status by age group. 87% of people aged 18 and over say their health is either good or very good. And get this: 69% of those aged 70 and over report their health as very good or good. Okay, maybe it's 'self-deceptions' rather than self-perceptions, still, it kind of makes you wonder whose filling all those hospital beds? Maybe the findings are why the Government wanted to remove free medical cards for over 70s? I jest of course: that would imply that the decision had been based on a rational assessment of the evidence relating to the health and financial circumstances of the elderly when plainly the decision was of the 'evidence-free' variety. Like so much else. I don't doubt, however, that there is considerable room for improvement in health care provision in Ireland. Assuming 'tear it up and start again' isn't an option (a pity really) then we can at least learn from other countries how to do things better. The Health Consumer Powerhouse have published an excellent comparative study of healthcare from the health consumer perspective called The Euro Health Consumer Index 2008. It looks at a range of outcomes from the health service consumer perspective (waiting times, outcomes, drug costs etc) and ranks EU countries accordingly from best to worst using a composite index measure. Ireland doesn't top the index unfortunately (I know, you're shocked): that honour goes to the Netherlands (we're ranked 15th out of 31 countries studied). But here's the interesting thing: Ireland's healthcare expenditure per capita is only slightly behind Denmark and Sweden (see chart on page 22) though nowhere near as high as the top spender Norway. But the latter doesn't top the overall index either: because on a value-for-money/'bang-for-buck' basis we are ranked 24th whilst Norway is ranked 25th (see page 23). Something to do with waste I reckon. Mind you, I'm not expecting a rapid improvement in our healthcare rankings any time soon. So I'd better just keep taking the vitamin tablets, like millions of other Europeans, knowing that I'll do more for my own health and wellbeing that way than depending on badly managed public healthcare services. As this report (pdf) on the Health Quality Agenda in Europe from the Stockholm Network points out. That way hopefully I'll be able to report my own health status as good or very good when I'm in the 70+ age group.